I show that the idea that Marx's objection to exploitation is based on injustice or LTP-grounded theft is mistaken. Marx's real objection to exploitation is based on unfreedom, that capitalist relations of production, he thinks, unnecessarily limit human freedom. In the first place Marx is quite clear that he vehemently rejects the concepts of justice, fairness, or rights as bourgeois ideology. It is true that he uses the language of "theft" on occasion, but either a literal interpretation of that language must be abandoned, or his consistent, life-long objection to rights- and justice talk must be given up. Second, the structure, indeed the point, of his analysis of the laws of motion of capitalism, is that capitalists make profits through exploitation of labor _without cheating_, by the normal "legitimate" operation of the system. Other arguments make the same point. The unfreedom or force-based view, though not necessarily my specific arguments advocated so far is shared by a minority of other writers, such as Nancy Holmstrom and Richard Arneson. What my paper offers that is novel, part from arguments for the foregoing that are different and better than those found elsewhere (although Holmstrom and Arneson are excellent), is an account of in detail of what Marx regards as the real problem with exploitation. I analyze Marx's objection that capitalist exploitation causes unnecessary unfreedom by distinguishing and spelling out three different kinds of freedom that he invokes: classic negative freedom, or noninterference; positive freedom, understood as control over or access to the resources enabling one to exercise one's negative freedom; and "real" freedom, as he puts it, the ability to "give the law to oneself," to regulate one's own activities under rules chosen by oneself, to develop one's capacities by autonomous choice. This puts Marx in the tradition going back through Hegel and Kant to Rousseau, the first express advocate of this idea. The opposite of real freedom, the unfreedom due to lack of autonomy, is alienation. 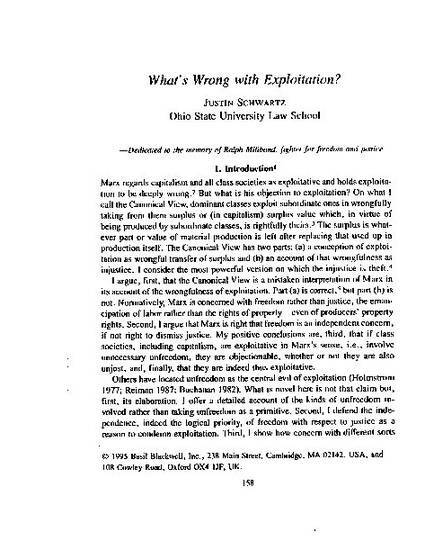 I conclude by stating that I think that justice-based objections to exploitation that avoid Marx's objections to the concept are possible. I do not attempt to spell these out here. I take up that task in my subsequently published paper Relativism, Reflective Equilibrium, and Justice, 17 LEGAL STUD. 128-168 (1997). The present paper is related to and partly overlaps with my paper In Defense of Exploitation, 11 ECON. & PHIL. 49-81 (1995), a critique of John Roemer's equality based account of the nature of exploitation and its wrongness. The research and writing of this paper was financially supported by the philosophy department of The Ohio State University.